Weighty Matters: Ferrero's worried you'll stop eating Nutella if you know what's in it. Ferrero's worried you'll stop eating Nutella if you know what's in it. The EU is en route to creating a front of package labeling program for processed foods. "influence even the habits and the most intimate aspects of one's personal sphere, like the genuine and healthy pleasures that are passed among generations"
Which of course serves as a great quote to help explain the point of nutritional labeling reform. So what's scaring Paolo Fulci? I'm guessing that he thinks that if people actually knew that each and every tablespoon of Nutella contains an astonishing 4 teaspoons of sugar (in Europe Nutella has more sugar than here in Canada where each tablespoon has 3 teaspoons of sugar) it just might influence how much Nutella they consume. The most amazing part of the story? 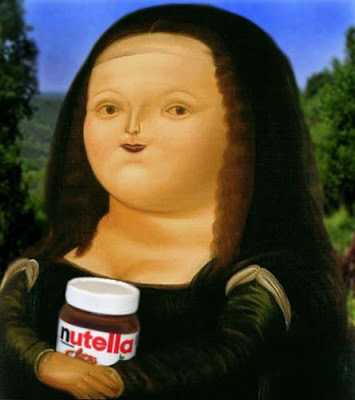 Apparently an Italian government official founded a support group specifically for Nutella. He's called it "Hands off Nutella" and together he and the group are accusing the EU of "nutritional fundamentalism". How dare we nutritional fundamentalists suggest people have the right to know what they're eating.